The Aberdeen Exhibition and Conference Centre (AECC) project – the largest ever won by Robertson – will deliver an outstanding facility in Aberdeen, combined with an innovative and world class energy centre. Click here to watch a video interview on the site with the Scheme’s Chief Executive Edward Hardy and the AECC project team. Robertson Construction is the main contractor for the £333 million new AECC, which is being built by Aberdeen City Council in partnership with Henry Boot Developments and is due to be completed in 2019. The Scheme asked Robertson Construction Group’s Project Director, Jo McMenamin how this exciting development was being enhanced by its Ultra Site status. Why did you choose your AECC project as an Ultra Site? 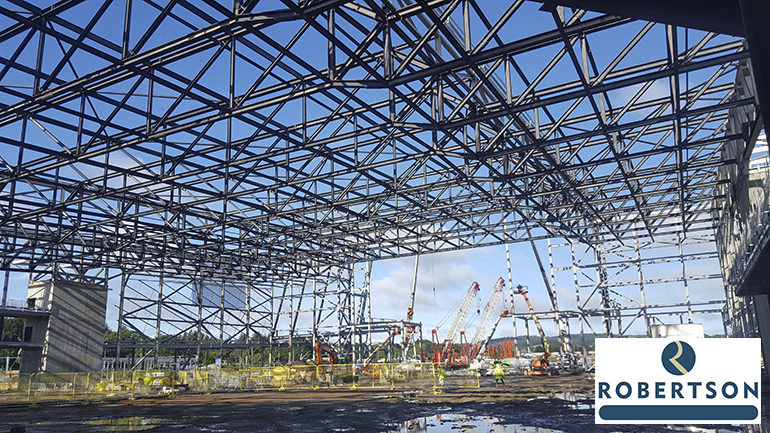 This project is currently one of the largest commercial building projects in Scotland. Its size, scale and value provided a great forum to try new things, demonstrating our creative and innovative approach to finding practical and effective solutions for our customers. The Ultra Site concept complements that approach perfectly, and provides an opportunity for us to stretch our delivery of the scheme. What are the benefits of being an Ultra Site for Robertson and its supply chain? 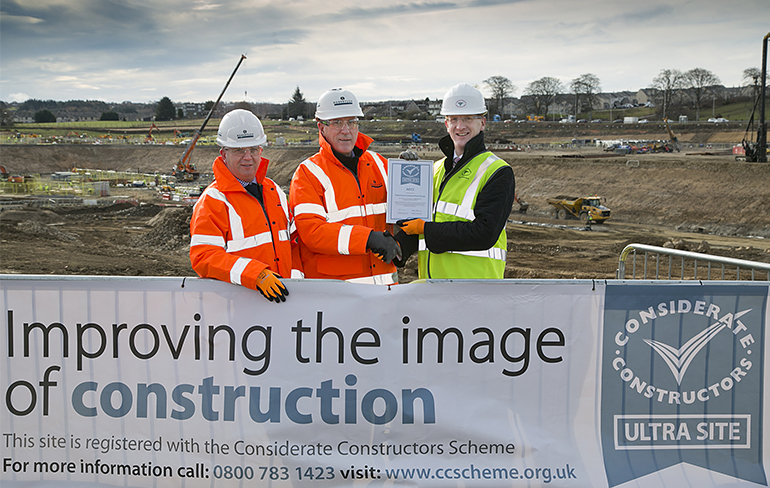 We have been a partner of the Considerate Constructors Scheme for several years and have been delivering a consistently high standard within the Scheme framework. We were keen to embrace this opportunity and look at how we could pass on these benefits to the supply chain. How does being an Ultra Site improve collaboration with your supply chain? We have always collaborated closely with our supply chain, working together to tackle the bigger issues that face the industry. The Ultra Site concept has heightened that collaboration on the AECC project and provided a mutual focus on topics like environmental practices, health and safety, occupational health, and mental well-being in particular. How did you engage with your supply chain and communicate the standards expected? Our CCS Monitor delivered a workshop to our supply chain explaining what the CCS is and what the benefits are. From there, we were pleased to see the take-up of the Scheme and we very much support our supply chain partners through the registration process. We appreciate that it is not something that suits every contractor and we had some difficult conversations along the way; it would be wrong not to acknowledge this. However, the partners who have bought into the Scheme have really embraced it. In turn, this has allowed us to tackle some of our objectives in delivering the Scheme, including onsite engagement and buy-in to Robertson-led initiatives. Please provide some examples of best practice in relation to engaging with the supply chain. We invite all our subcontractors to attend a bi-monthly engagement session, which provides an opportunity for discussions, briefings and updates across a variety of topics. We then went on to set up sessions with employability partners and local Construction Industry Training Board advisors to discuss training opportunities. What were the key lessons you learnt from the pilot? It definitely reinforced the importance of early engagement with our supply chain. Having the CCS assist us with workshops to explain the benefits certainly helped answer key questions our subcontractors had. What advice would you give to other contractors considering registering as an Ultra Site, and the supply chain working alongside them? It’s not scary or difficult! If you are delivering at a high level within the Scheme already, this will feel like a natural progression. Supply chain engagement is key to making the real difference. The support from the Scheme and advisory visits from the Monitors make this an incredibly collaborative process and CCS support and advice is always at hand. The CCS won’t deliver the Scheme for you – it is imperative that you deliver it yourselves. However, the advisory meetings are a great helping hand. Would your organisation consider registering further projects as Ultra Sites in the future? Definitely. It is important to have a project with a suitable duration though, to really see the difference it can make. Could you sum up in once sentence your overall experience as one of the Scheme’s Ultra Sites? Collaboration is the way forward: Tackle the bigger issues together; otherwise you’re swimming against the tide. How do you think Ultra Sites benefit the construction industry as a whole? 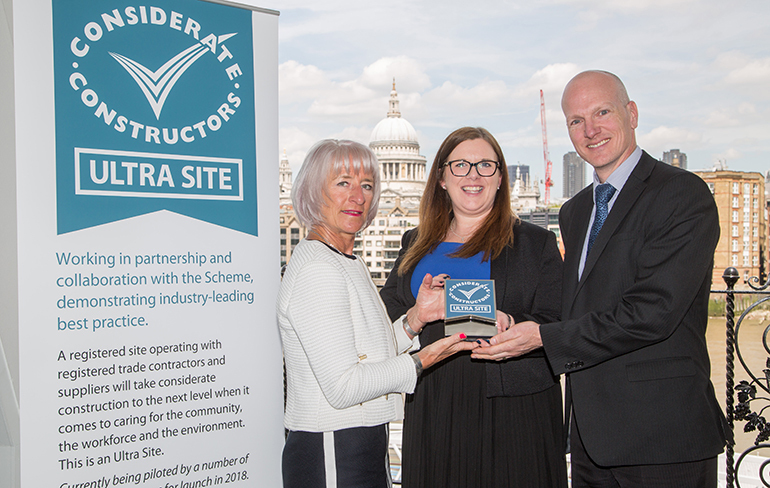 Ultra Sites should be a beacon of best practice; I don’t think that just applies to the Considerate Constructors Scheme, you have to adopt that attitude throughout the delivery of the project. If you are already delivering a project at that level – a CCS Ultra Site is for you. For Robertson, there are three critically important elements to being a CCS Ultra Site; the first relates to the improved service we can pass on to our clients, Aberdeen City Council and Henry Boot, as a result of our enhanced collaboration and communication with our supply chain partners. The second is the benefits it delivers for the community. The CCS encourages direct engagement with the communities within which we operate. As a result, the residents and wider public are kept up-to-date with any developments on or surrounding the site. They are invited to community engagement events and know who they can contact if they have concerns about anything related to the construction site. By adopting this approach, we improve the reputation of the construction industry as a whole. Finally, it is our connectivity with our on-site team. Our workers are our most valuable asset, and by ensuring we have strong employee engagement, we can make sure that our team is working in line with our expectations. But more importantly, our team feels empowered to come to us with recommendations for improvements or concerns over work practices and personal well-being – be it emotional or physical. This enhanced level of communication allows us to protect the well-being of our workforce and you can’t put a value on that.